May saw a semi-surprise release of a new album from George Clinton’s legendary Parliament, the group’s first in 38 years. The expansive, 23-song Medicaid Fraud Dogg clocks in at an hour and forty-six minutes, and every second is imminently listenable. While the group keeps groove at the center of its music, this ain’t your parents’ Parliament. This iteration of Parliament is not staffed by the regulars that longtime listeners might expect, such as Bootsy Collins and the late Bernie Worrell (though Fred Wesley does make an appearance on trombone on “Type Two”), but by a group of young gun musicians that prominently features Clinton’s grandson, vocalist Tracey “Tra’zae” Lewis-Clinton. This line-up does not hamper the group’s groove, but it does change it. 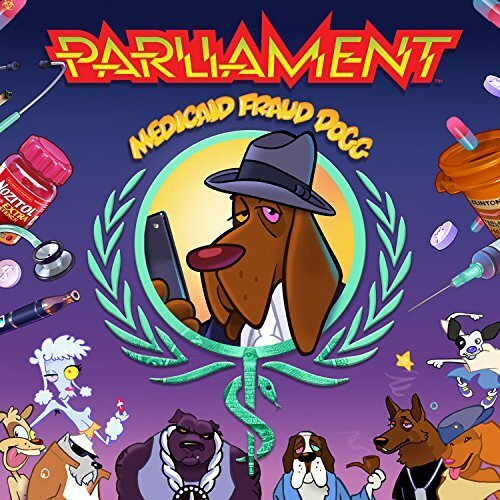 Medicaid Fraud Dogg contains some classic P-Funk grooves on tracks like on “69” and “Insurance Man,” but much of the album is far more influenced by contemporary hip hop. In fact, it seems like this album reflects Clinton’s listening to artists who previously listened to him. “Backwoods” is a trap-inflected song that listeners would probably be more likely to hear at a club in Atlanta than on an intergalactic voyage. “Loodie Poo Da Pimp” shows Clinton’s influence filtered through Snoop Dogg, then Kendrick Lamar, then back to Clinton. The album’s best moments embrace not having to sound like Parliament but choosing to sound like Parliament. “I’m Gon Make You Sick of Me” is an old-school deep-in-the-groove Parliament track, featuring Scarface (as ‘Dr. Feelgood’) rapping, while “Antisocial Media” is a deconstructive interlude that flirts with free jazz musical textures to express postmodern angst. Both songs feature classic elements of the P-funk playbook filtered through the past 30 years. Will Medicaid Fraud Dogg satisfy listeners who long to collect every deep cut from Parliament’s 1970s heyday? Probably not—but the album would likely be pretty boring if it were simply a regurgitation of the group’s classics. Rather, it represents a reinvention of George Clinton, an artist who is learning from those he influenced and creating some great new sounds while doing it. 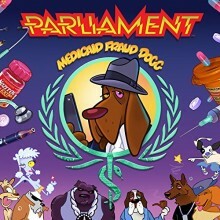 This album succeeds precisely because of Parliament’s flexibility and the malleability of the group’s format—Medicaid Fraud Dogg demonstrates that it is possible to teach an old Dogg (in this case, the group of musicians bearing the name Parliament) new tricks. This entry was posted in Rhythm & Blues, Soul, Funk and tagged 2018, 2018 music, 2018 music review, C Kunspyruhzy, CD review, funk, Matthew alley, Medicaid Fraud Dogg, Parliament by aaamc. Bookmark the permalink.